Being an overnight Administrator I get a lot of low disk space alerts when drives hit their thresholds. Tonight I’m going to put an end to all this work. I wrote the following script to help automate the cleaning of C:\ drives or any drives that have a Windows operating system installed. 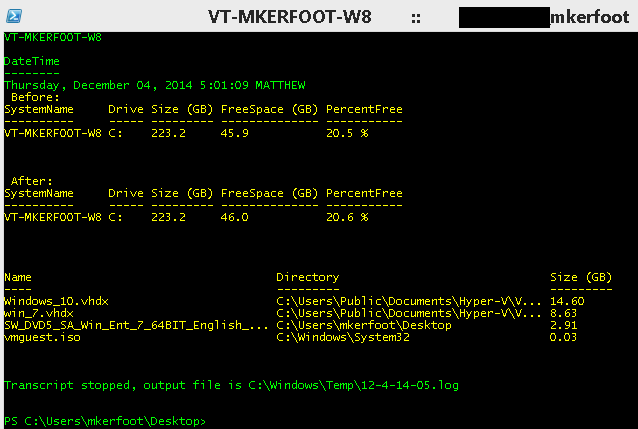 Outputs disk space before and after. Cleans up the C: drives temp files and other misc. unneeded files. ## Cleans all code off of the screen. ## Stops the windows update service. ## Windows Update Service has been stopped successfully! ## Deletes the contents of windows software distribution. ## The Contents of Windows SoftwareDistribution have been removed successfully! ## Deletes the contents of the Windows Temp folder. ## The Contents of Windows Temp have been removed successfully! ## Deletes all files and folders in user's Temp folder. ## The contents of C:\users\$env:USERNAME\AppData\Local\Temp\ have been removed successfully! ## Remove all files and folders in user's Temporary Internet Files. ## All Temporary Internet Files have been removed successfully! ## All IIS Logfiles over x days old have been removed Successfully! ## deletes the contents of the recycling Bin. ## The Recycling Bin has been emptied! Now just open an elevated command prompt and run the this script. Note this would have cleaned up more files and given a long verbose string of files removed except I just ran this against my computer and it brought it from 18% free to 20% free(which was shown above). Now all you have to do is Download my script here! Have you ever wanted to view the neighbor cache or possibly the IP address of a friend or family members networked device? New with PowerShell 3.0 is the cmdlet Get-NetNeighbor which will retrieve all neighbor cache information for IPv4 and IPv6 by default. Type netsh, and then press ENTER. Type interface ipv6, and then press ENTER. Type show neighbors, and then press ENTER. Now don't get me wrong that method still works......however with PowerShell 3.0 we can just type Get-NetNeighbor (as shown below). The Get-NetNeighbor cmdlet is an awesome addition to PowerShell, this cmdlet allows us to have the same capabilities as we always could before with netsh and just like a Cisco network device by running the command show CDP Neighbor. I like to modify this cmdlet at little bit to show me only IPv4 address' that I have recently talked to. I find the output of the above cmdlets ussually gives me everything I want to know. Have you ever wanted to open a .HTML file with PowerShell, either in a script or just because you were already in a PS console? There is actually a really easy way to do this in your default browser via PowerShell. The cmdlet "Invoke-Expression" will run the any command or expression. contains the command or expression. The Command parameter is required. In order to open an .HTML file from PowerShell you must first know the location of the file, then simply type, "Invoke-Expression .\filename.html"
Invoke-Expression can also be used to open an image or any filepath applicable. The Following command will open up the file I specified in your default browser.